There are three strategies for KM implementation, and in all but the simplest cases, only one of these is reliable. Knowledge Management is a framework of many components (roles, processes, technologies and governance). 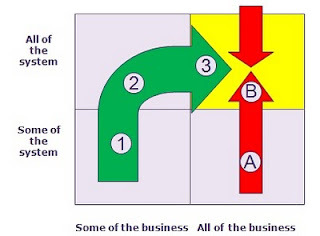 Your business is a combination of many divisions and departments. In terms of implementation approaches for Knowledge Management, you ultimately want the organisation to be in the box where all of the knowledge management framework is used by, and embedded in, all of the business. This is the yellow box shown in the diagram, and this is your ultimate implementation destination. However there are three routes you can take to the yellow box. Firstly you can go straight into the box, design a system in isolation and roll it out across the business, with no testing. This is the top red arrow that takes you straight into the yellow box. We don’t recommend this route - it's too easy to get it wrong, and there's no opportunity to tweak the system en route. For all but the smallest organisations with the simplest KM needs, this is a very risky approach. 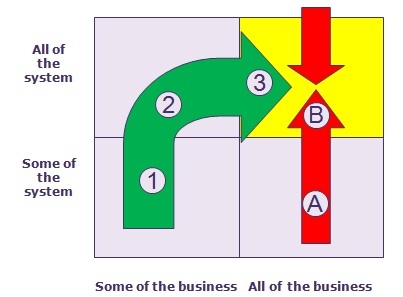 Secondly you can roll out components of the system across the business, building and testing the system piece by piece (point A) until it is complete (point B). This is the second red arrow, and we don’t recommend this route either. Firstly the individual components are unlikely to add much value on their own. Secondly, you have no opportunity to test how all the components work together. What we do recommend, is two stages of testing in small parts of the business. Firstly proof of concept testing of specific interventions (point 1, bottom left box, some of the system in some of the business), and then piloting the whole system (point 2, top left box) prior to rolling out across the whole organisation (Point 3). This takes longer, but is far more robust.